The visitor enters a dark room, where he can light a candle. Then, sparks appear and a hazy image of a face is slowly formed. The face fades when the visitor blows out the candle. This interactive installation is a comment about the haziness of memories, and a tribute to the beloved departed. 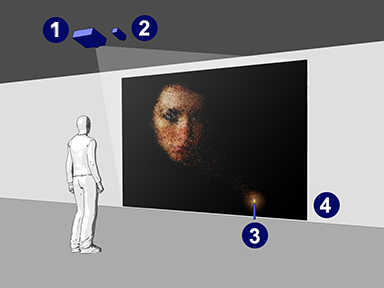 The installation components are shown in the image on the right: a computer (not shown) renders the animation in real time and presents with a projector (1) at a large projection area (4). The visitor is using a real candle (3) that is tracked by an infrared camera (2).